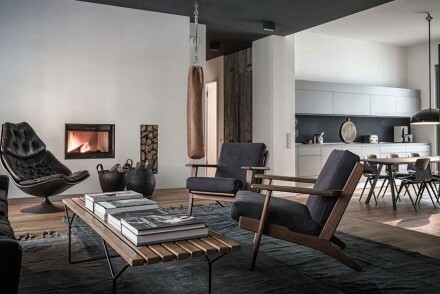 Situated on a quiet, tree-lined residential street that borders Brixton and Clapham in London, Slip House is surely one of the most exciting properties to come on the market so far this year. After all, as architectural pedigrees go, this house offers some top-notch credentials. 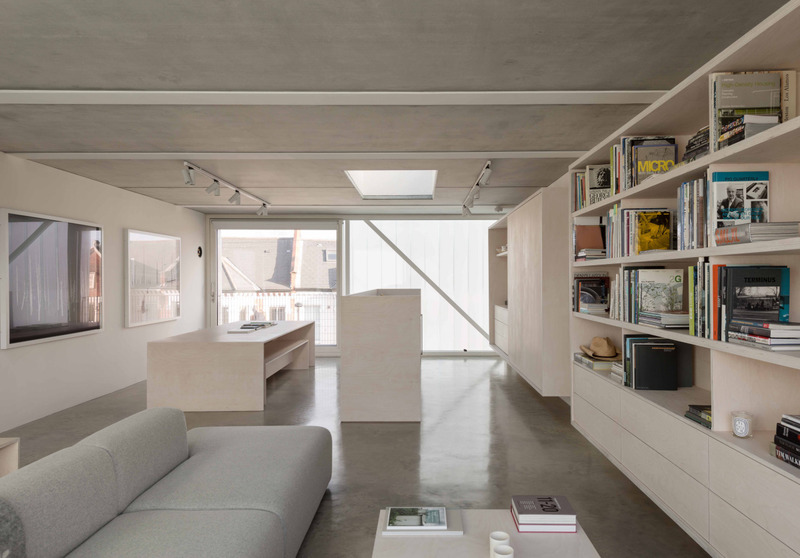 Designed by the renowned architect Carl Turner as his own home, Slip House was awarded the prestigious RIBA Manser Medal in 2013 – which is presented to the best house in the UK. 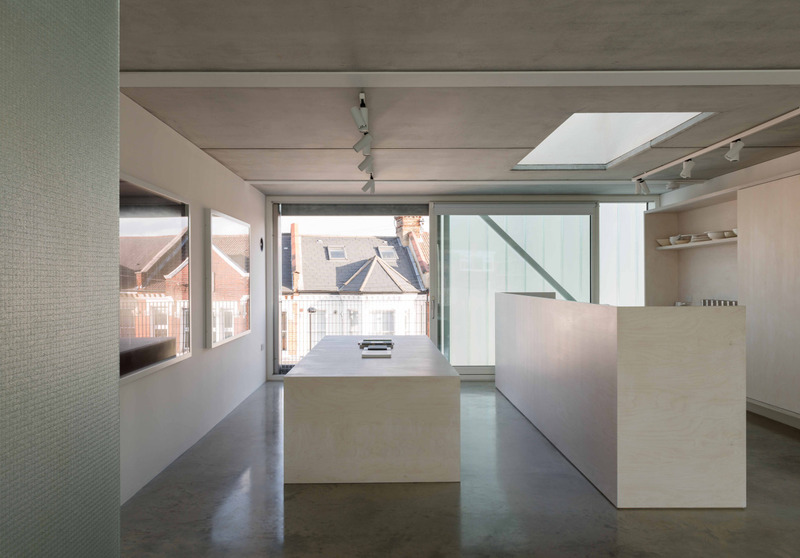 The building was described by the judges as an “exemplary low-energy home… (with) refined quality of spaces”, while Grand Design’s Kevin McCloud has referred to the house as an “urban sanctuary”. Houses of this architectural calibre are rare finds on the market. Slip House occupies one of four plots on this Brixton terrace and neighbours include another celebrated eco house (which was sold in 2012 by The Modern House, who are also marketing this property), a second house designed by Carl Turner that is currently under construction, and a further eco house that has recently been granted planning permission. 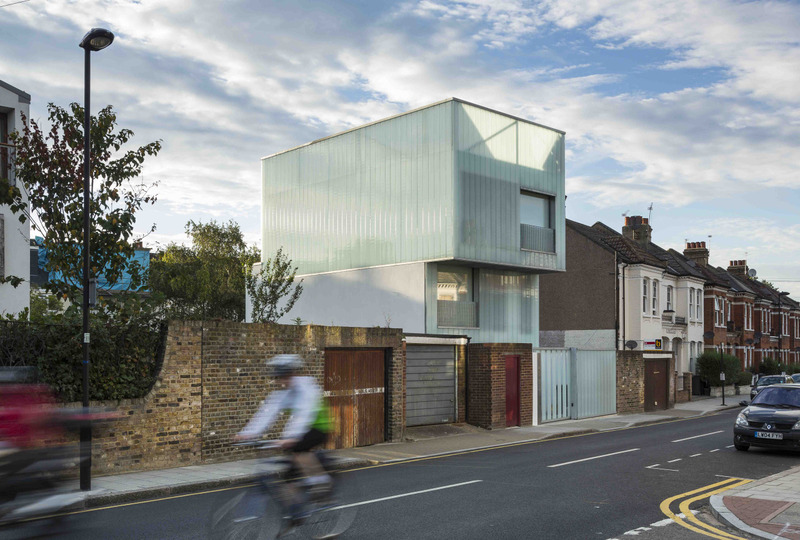 Slip House has a striking sculptural quality. 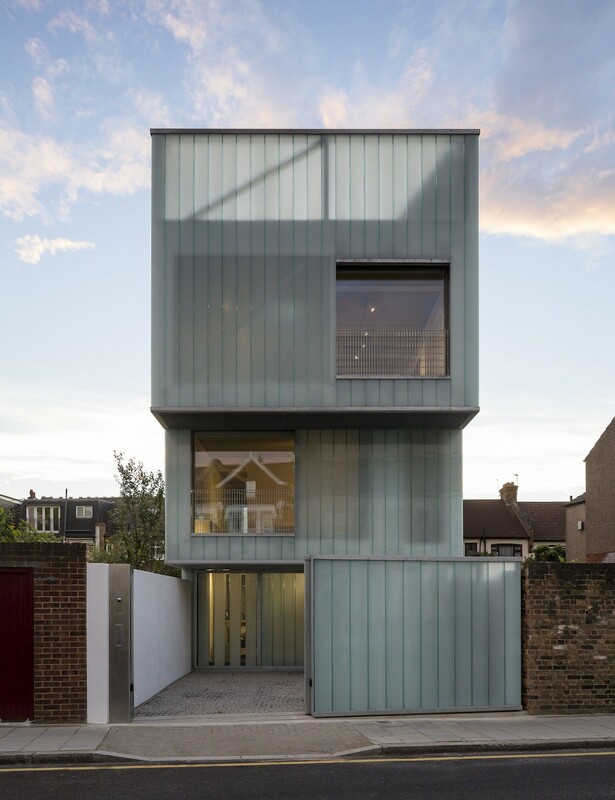 The house is constructed from translucent glass with steel and concrete, and is arranged over three floors that are formed by three cantilevered or ‘slipped’ boxes. The combination of the milky glass panels and the shape caused some locals to refer to the building as the “ice cube”. These boxes have been positioned to maximize light while minimizing any intrusion on the outlook of the neighbouring buildings. 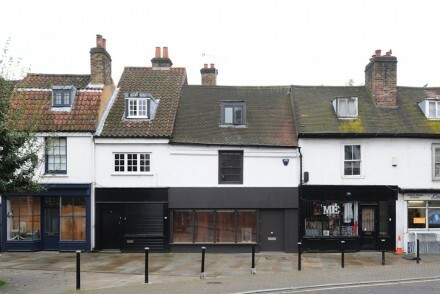 The ground level is currently used by Turner as a studio space for his practice, and there’s also a small rear courtyard and a kitchen area here. This level could easily be adapted to become part of the main house – by creating two additional bedrooms, say, or a bedroom and another reception room – or it could become a self-contained apartment with a two-storey house above. This flexibility was at the core of Turner’s approach to the design concept. 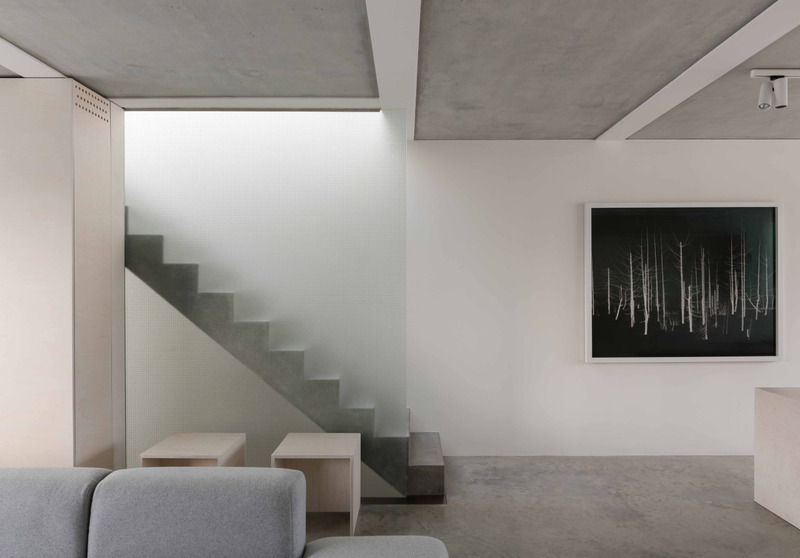 The first floor contains the two bedrooms, along with an en-suite bathroom for the main bedroom, while the second floor forms an open plan kitchen, dining and living space featuring full-height glazing at either end. 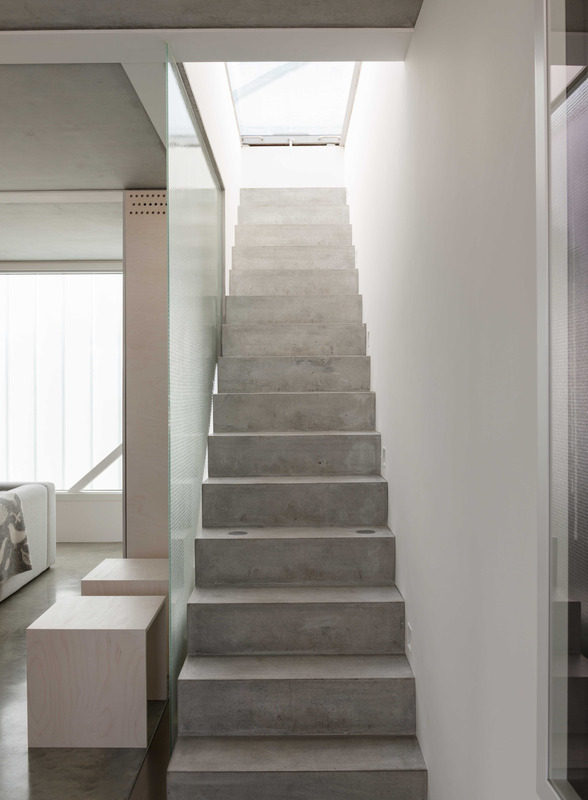 A minimal concrete staircase leads to the roof terrace above. 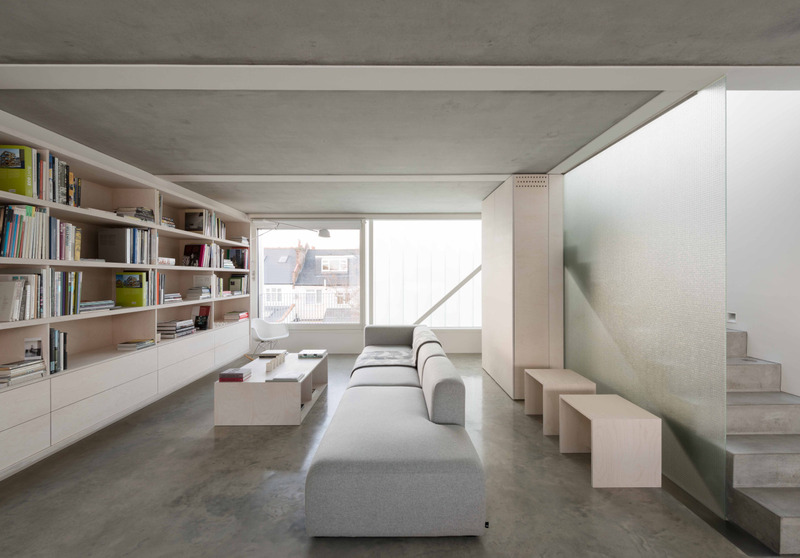 The use of polished concrete creates a calm and tactile backdrop for the furnishings, and Turner has accentuated this mood with the chalky palette of furniture and finishes, and with the super-sleek bespoke cabinetry in whitened birch ply. This house also has serious eco credentials, having achieved a rare 5 rating in The Code for Sustainable Homes, and features ‘energy piles’ that use a solar assisted ground source heat pump integrated into the pile foundations; PV-T panels that generate both the hot water and heating; mechanical ventilation with heat recovery within an airtight envelope including massive levels of insulation; and rain water harvesting. Striking those these photos clearly are, I’d suggest that Slip House is best appreciated with movement and the interplay of light through the spaces, so it’s certainly worth watching this short film by film studio Stephenson/Bishop on Dezeen where Turner talks about the flexibility of this distinctive home/working space. Slip House was marketed by The Modern House. External photography by © Tim Crocker. See the Steller story on Slip House.